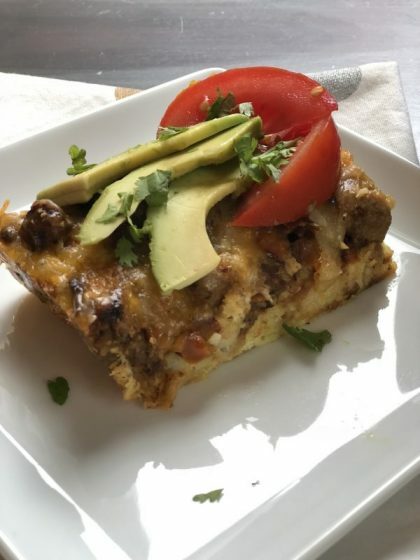 This breakfast casserole has become my go-to recipe when I want a tasty, filling start to my day. And of course I frequently make a larger version when we’re hosting brunch or houseguests. I really love how versatile this recipe is – I can swap out the meats, cheeses, and seasonings to suit my mood (or to use up whatever is in the fridge). And did I mention that the use of tater tots rather than bread makes this gluten free? Bonus for all you GF’ers! Another thing I love about this casserole is that the leftovers reheat really well. I’m planning to tweak this recipe into individual “muffins” soon to make an easy grab-and-go breakfast during the week. Stay tuned! It's all in the title! A delicious and filling breakfast casserole of cheese, eggs, meat, and fluffy, crispy tots. Share it with someone you love or save the leftovers for tomorrow! While tater tots are cooking, crisp up your bacon and allow it to cool before crumbling. You can cook your bacon stove-top over medium heat or on a cooling rack set inside a foil-lined baking sheet right alongside your tots. In a small saute pan over medium heat, cook up your onions, peppers, and garlic with a little EVOO . Cook until translucent (about 3-4 minutes) and season with salt and pepper. Cheese - I take a little help from the grocer here and use pre-shredded, reduced-fat cheese.